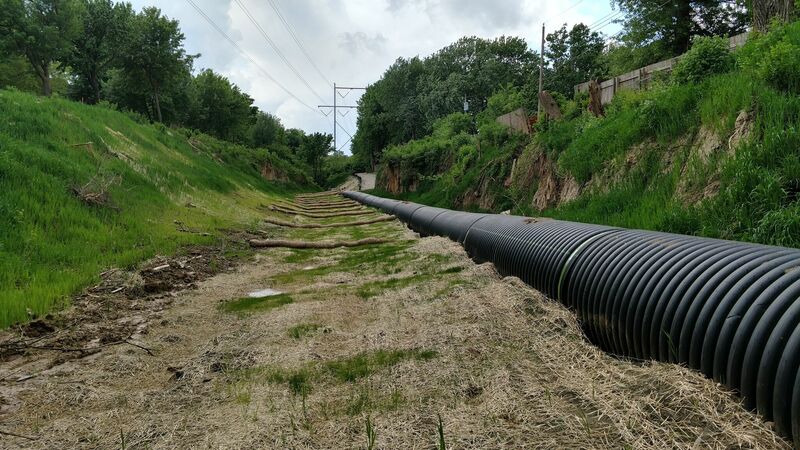 The Oakbrook Channel Stabilization project consisted of rehabilitating approximately 475-feet of channel, the repair of a damaged storm sewer system, extension of a 60 inch storm sewer pipe, and installation of an Impact Basin for the City of Omaha. 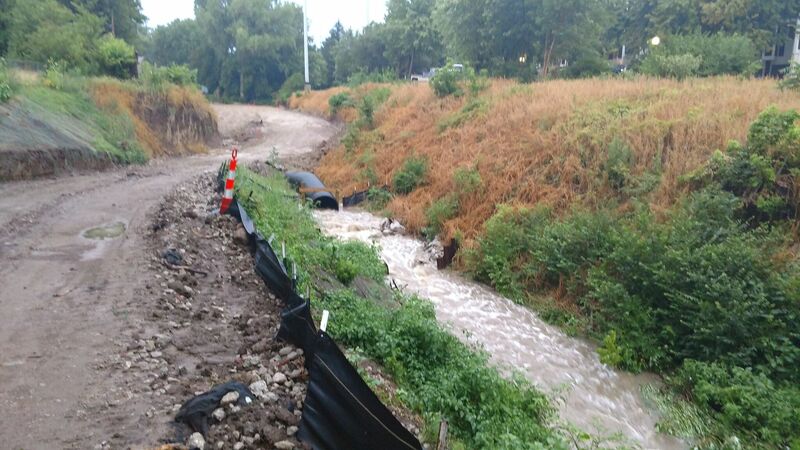 Throughout the duration of the project, stormwater runoff was of utmost concern. Even the smallest of storms would fill the channel making it impossible to work. The channel is located between two residential neighborhoods, which made access to the channel very difficult. Valley Corporation had to construct a temporary access road along the west bank of the channel. Due to the limited space, the access road was restricted to one lane wide. This slowed down construction because a limited amount of activities could be going on at once. 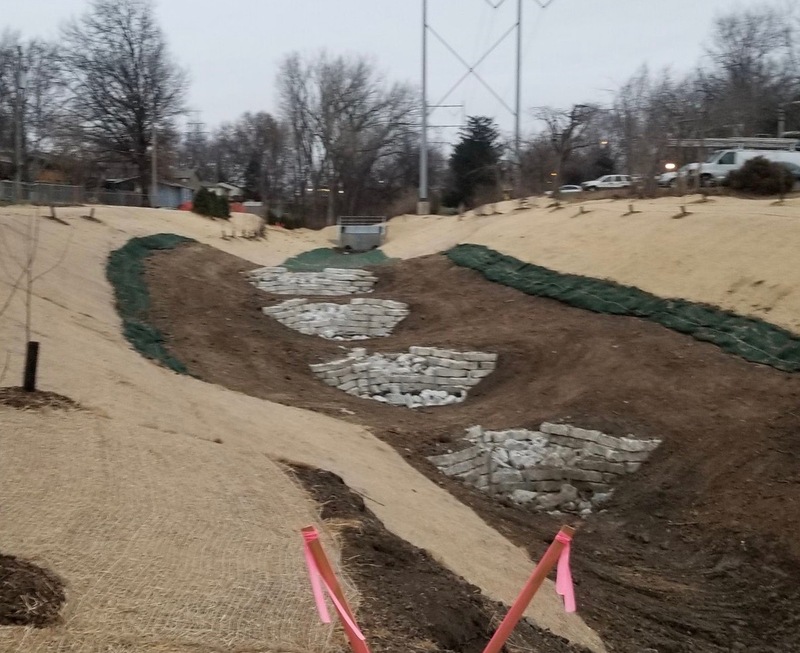 In addition, much of the work on the west slope could not be completed until the access road was removed. Temporary access road after a rain event. 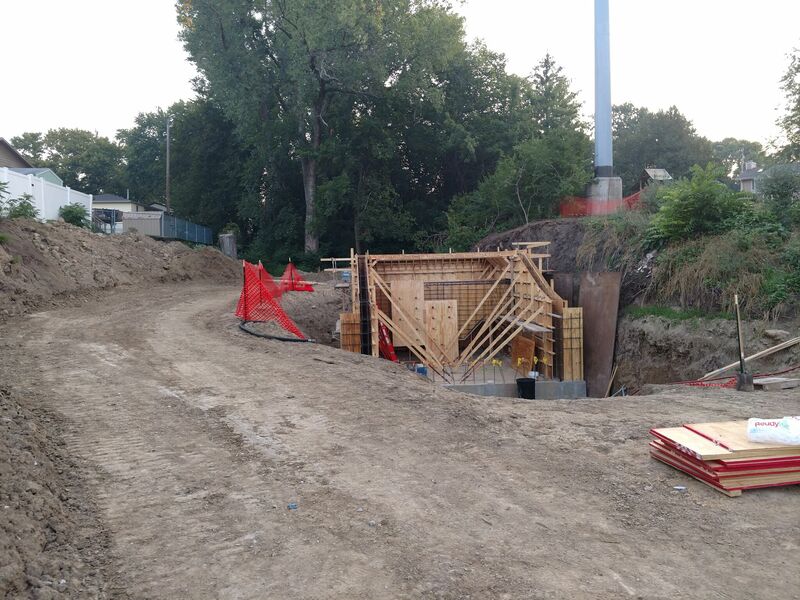 Valley Corporation formed and poured the Impact Basin onsite. 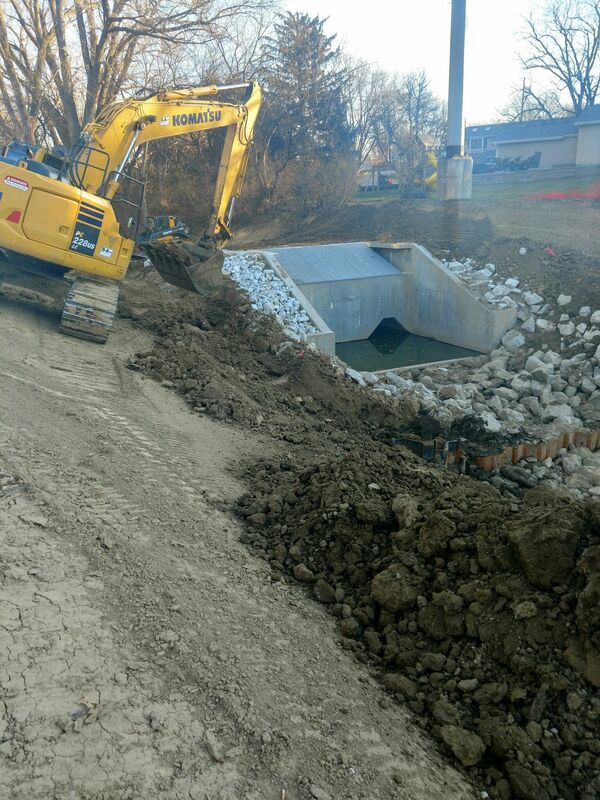 Due to the constricted site access, work had to be sequenced and performed in the creek. Working in the creek had its own unique issues, predominately water management and unstable soils. The Impact Basin itself was a very complicated structure with many openings and angles making it difficult to form. 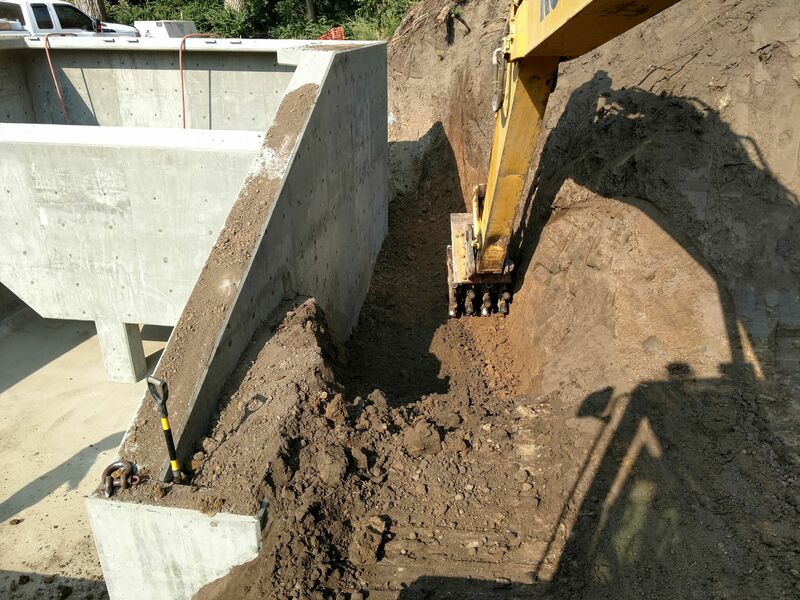 Valley Corporation’s Structure crew was able to handle the structure and complete the project on time. The impact basin after formwork removed. A finished view of the limestone drop structures. © 2019 VALLEY CORPORATION. ALL RIGHTS RESERVED | DESIGN & DEVELOPMENT BY LP CREATIVE CO.